Honey bees existed 100 million years ago and health-giving properties of honey were known to the Ancient Egyptians and Romans. Vanilla Ice Cream is always a great treat, whether for a special celebration or just a fun dessert after dinner. Here is my custard base vanilla extract recipe. Method: Beat together the egg yolks and honey in mixing bowl. Heat the milk in a saucepan until it reaches boiling point, then simmer. Whilst it's simmering stir in the egg yolks/honey mixture. Continue to stir until it thickens. Remove from the heat, strain and leave to cool. Honey has been a popular food for thousands of years. 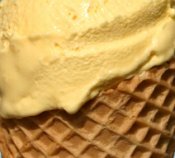 It has a fascinating history and many health benefits so it's not surprising that it is a really popular ice cream flavor. I also have a honey and spice ice cream recipe you can try here. Delicious! TIP: If you don't like regular sugar then honey can be used as an alternative sweetener. Read more about making sugar free ice cream.